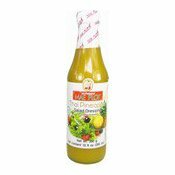 This pineapple salad dressing produced from fine quality pineapple natural is wonderful in mixed vegetable salad and is ideal as a dipping sauce. Shake well before use. Ingredients: Water (46.0%), Pineapple (20.5%), 10% Distilled Vinegar (Cane Sugar) (12.5%), Sugar (13.5%), Pickled Yellow Chilli (6.8%), Salt (0.4%), Stabiliser (Xanthan Gum) (E415) (0.3%). Simply enter your details below and we will send you an e-mail when “Thai Pineapple Salad Dressing (菠蘿沙律醬)” is back in stock!